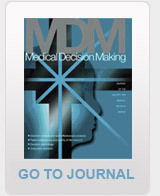 The Society for Medical Decision Making's mission is to improve health outcomes through the advancement of proactive systematic approaches to clinical decision making and policy-formation in health care by providing a scholarly forum that connects and educates researchers, providers, policy-makers, and the public. Our vision is that systematic proactive approaches should be used for decision making in health care. We are promoting an integrated approach to health care decision making based on multiple perspectives and expertise from multiple disciplines. Optimal communication among those involved in healthcare decisions will facilitate informed and shared decision-making by policy-makers, physicians, patients, and the public. We value interdisciplinary scholarship and a global perspective on health care. Methodological excellence, both in breadth and depth, is important to us. At the same time we value the inspiring, energizing, respectful, collegial, and friendly learning environment that the Society provides. By being connected to the health care enterprise in diverse ways we hope to have a positive impact on decision making in health care. Improve the health and clinical care of individuals and populations by developing and promoting the use of systematic methods to deal with the uncertainties of health care decisions. Foster and promote research for medical (health care) decision making. Advance the scientific basis for and foster synergies between multiple areas relevant to medical decision making. Develop and evaluate techniques for assisting clinician's decision making under uncertainty. Develop and evaluate tools for shared decision-making with patients and the public. Advance the scientific basis of the field by holding scholarly meetings, offering courses, publishing a highly ranked peer-reviewed journal, and providing information through the Society's website. Provide a training ground for scholars in the field of medical decision making. Serve as an incubator for the generation of new knowledge, methodological advances, and career development in decision sciences in healthcare. Foster and promote international exchange and synergies between health care decision making scholars from different countries. Provide a forum and professional home for our members where they can benefit from support and feedback from peers and be inspired and energized by the peer interaction.